The electricity usage is offset by purchasing Renewable Energy Certificates that are used for wind power projects to support use of non-polluting wind-generated electricity. The thermal energy usage to produce many of the grades of paper is offset through buying carbon credits that fund renewable energy or emission-reduction projects. This type of paper is produced from fibers using alternative compounds as a substitute for elemental chlorine. Eliminating the elemental chlorine reduces harmful by-products. This type of paper is produced from recycled fibers that were processed without the use of any additional chlorine or compounds. PAPER ISN'T THE ONLY PROCESS DEDICATED TO REDUCING WASTE - SO ARE OUR PRINTERS! *Total waste produced from printing 4,000 sheets per month for 4 years. 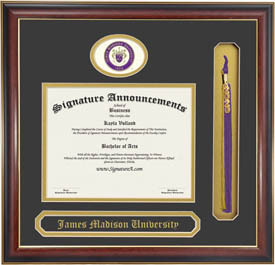 The pine lumber that is used for Signature Announcements products is commonly known as plantation wood. This plantation wood is only used to grow native species of wood to North America. The lumber company owns a total of six farms which equal a total area of nearly 4,000 acres. 64% of this total area is preserved with native tree species. The National Forestry Service require that any company who cuts down trees must plant 3 trees for every 1 cut. Our supplier has been adhering to this standard for over 13 years. Our supplier uses a water treatment system to use on all raw materials to produce the moldings to make our diploma frames. This minimizes the emission of pollutants in the air as well as preserving the environment.